When the history of cars in the Nineties is written (and surely someone at Motorbooks International is already working on it), the car that deserves the biggest chapter is the mid-engine, two-seat Acura NSX. 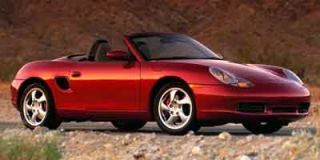 Not because it sold in the biggest numbers, had the most power, was the quickest or handled better than any other during the decade, but because it set the standard of excellence to which every other car was eventually compared. Remember the crap Ferrari was foisting as its best in the Eighties? 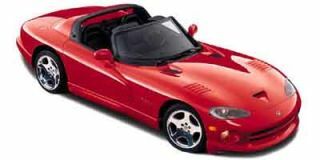 Do you really think they’d have come back so strongly with the F355 and 360 Modena if there hadn’t been the NSX’s example to follow? Which car pioneered the use of aluminum construction? Which was the first to bring electronic variable valve timing to North America? Of course it was the NSX in both cases. And in the early Nineties, thanks to its amazing balance, humongous ability and surprising practicality, it was clearly the greatest car in production. But at this point the NSX is seriously dated in significant ways. Hell, it’s one of the few cars out there with a tape deck AND NO CD PLAYER. 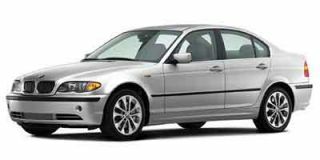 But it’s been freshened for 2002, it remains one of the most engaging cars to drive ever built and it’s as close as any buyer can come to acquiring factory fresh, fully warranted automotive history. New High Intensity Discharge (HID) fixed-position headlights are the most obvious change to the NSX and they fill the hole that had been used by the pop-up headlamps elegantly. 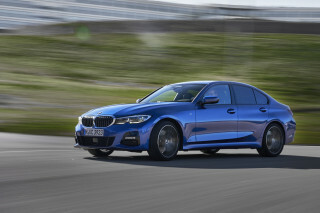 There’s also some subtle re-shaping of the hood, new front fascia, new chin spoiler and in the rear the turn signals are now isolated in their own circular housings and the spoiler and exhaust system’s appearance has been tweaked. Beyond that, there’s also the inevitable set of new wheels. The headlights are neat pieces of thermoplastic art, but the car itself is still instantly recognizable as an NSX or, more accurately an NSX-T as all NSXes coming to North America now feature a removable roof panel (though the disingenuous “T” – not for Targa – part of the name is gone). Also new is the suspension tuning, which now uses higher spring rates in front and a larger diameter rear anti-sway bar working with new larger tires. For the first time all four of the NSXes wheels are now the same 17-inch diameter. 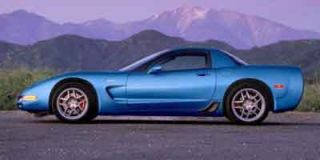 The front tires are now P215/40ZR-17s instead of 2001’s P215/45ZR-16s and the rears swell from P245/40ZR-17s to P255/40ZR-17s. Remember back when the NSX first appeared as a ’91 that it wore P205/50ZR-15 front tires and P235/50ZR-16 rears and had a particularly voracious appetite for them. Still in an era when Honda is selling Civics on 17-inch wheels (on the Type-R every place but here) and Dodge sells a pickup wearing 24-inchers, the 17s on the NSX seem quaint and charmingly old school. The total effect of all the changes, Acura claims, is to “not only enhance the way the NSX looks, but also make it more aerodynamic and boost its already impressive performance.” Looks are relative, but it would be tough to contend that in the new NSX looks any better in the context of 2002 than the original car did when it was introduced nearly a dozen years ago. And since so much of the NSX is untouched, the improvement in actual performance is so slight as to be almost imperceptible and depending on test conditions, maybe even immeasurable. Admittedly, however, we didn’t have a chance to discover whether Acura’s claim that top speed has increased from 168 to 175 mph. 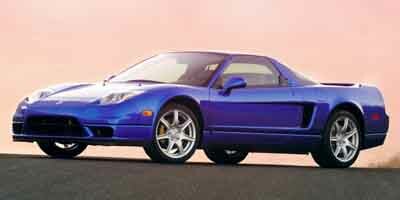 Most of what’s aboard the 2002 NSX is essentially the same stuff that stuffed the 2001 model. Power for the six-speed manual version of the car comes from a 90-degree, 3.2-liter, DOHC V-6 equipped with Honda’s now-obligatory VTEC variable valve timing system producing 290 horsepower. 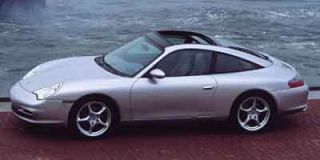 For the few buyers who want to dilute their NSXperience, a four-speed automatic is available featuring the semi-manual Sequential SportShift system hooked to a 3.0-liter version of the engine making 252 horsepower (less than what Acura offers in the TL Type-S sedan with a five-speed automatic). Also returning is the stiff, all-aluminum structure to which is mounted an aluminum suspension featuring double wishbones at each corner. And, naturally, bolted to those wishbones are oversize disc brakes controlled by an anti-lock system. Also practically unchanged is the interior, which was never the NSX’s strong point and hasn’t aged well. Full of design cues familiar to anyone who has driven late-Eighties and early-Nineties Hondas, the interior features such nostalgic bits as two distinct horn buttons on the steering wheel instead of today’s common simple slam-the-center panic switch, the digital clock uses red LEDs, confident control of the ventilation system takes concentrated practice and tuning the right/left balance, bass and treble levels of the aforementioned CD-less sound system means manipulating wee little dialing wands and probably chipping a manicured nail (I’m billing Acura). It’s all so 1991 that you half expect to turn on the radio and hear that Schwarzkopf has accumulated enough armor in the Kuwaiti desert and he’s ready to invade Iraq. In the interior’s defense, it’s beautifully stitched in nice leather, the instrumentation is large and easy to read, the seats are supportive and comfortable, and the black leather went perfectly with the test car’s gorgeous “Long Beach Blue Pearl” paint. You could drown in that paint. The NSX driving experience has evolved somewhat through the years, but it remains essentially the same; this is a car of enormous limits and limitless manners. Dive into a corner at what should be an insane velocity and the car handles it with nonchalance and almost goads you to dive deeper and hotter into the next corner. The steering is direct, perfect weighted and with the new tires and tuning, quicker than ever before. This is still a nearly neutral, nearly perfect handling car. With a throaty growl through it’s intake and an amazing eagerness to rev (the lightweight reciprocating assembly includes titanium connecting rods), this is a very flexible, overachieving, always-friendly engine. 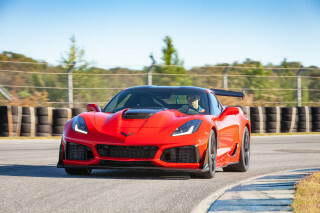 But at 290 horsepower it seems a bit down on power with cars like the much cheaper Corvette at 350 horses (405 in the Z06), mid-engine competitors like the 360 Modena at 400 horsepower, and even other Acuras sneaking up on it. 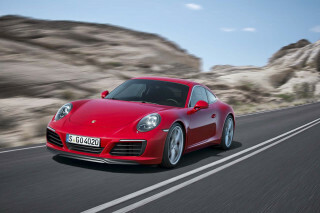 Still, slamming through the six perfectly spaced gears, this remains a seriously quick automobile – think low 13s in the quarter-mile and zero to 60 mph times of around 4.8 seconds. But there are quicker cars. As an automotive artifact, the NSX is up there with the Mercedes 300SL Gullwing, Jaguar E-Type, and original Porsche 911 Turbo as sports cars that defined their eras. But like the Gullwing, E-Type and Turbo, this is a car whose time has passed. And the $89,765 price seems particularly steep when you realize the dang-wonderful 2003 Nissan 350Z is available for around $30K and offers just three less horsepower. And the 350Z comes with a CD player, not just pre-wired for a CD changer. It’s time for Honda (er, Acura) to stun the world again. To go back to the drawing boards, take all the latest technologies and develop a new NSX that will once again earn the title “World’s Best Car.” Honda is perfectly capable of build – and likely to build – just such a car.